Ready-made recombinant, anti-idiotypic monoclonal antibodies, highly specific for the chimeric antibody drug infliximab (Remicade). The Type 1 anti-infliximab antibodies inhibit the binding of the drug infliximab to its target TNFα, and therefore detect free drug. These antibodies are ideal for use in direct ELISA, pharmacokinetic (PK) bridging assays and to develop and calibrate immune response (IR) assays to measure the anti-drug antibody (ADA) response in patient sera. The Type 2 anti-infliximab antibodies do not inhibit the binding of infliximab to TNFα and can therefore detect total drug – free, partially bound and fully bound. 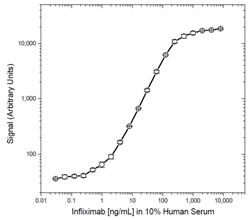 These fully human antibodies can be used to measure the infliximab levels in patient sera. Antibody generation using HuCAL® technology results in highly specific and sensitive antibodies, which are ideal for PK and PD assays. 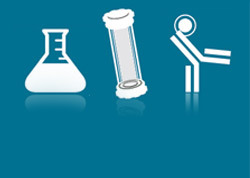 Antibodies are fully human, so are also perfect as controls or calibrators for ADA assays. The in vitro production of recombinant antibodies means that there is a consistent, secure supply throughout preclinical development and clinical trials, avoiding the need to develop new reagents. Table 1. 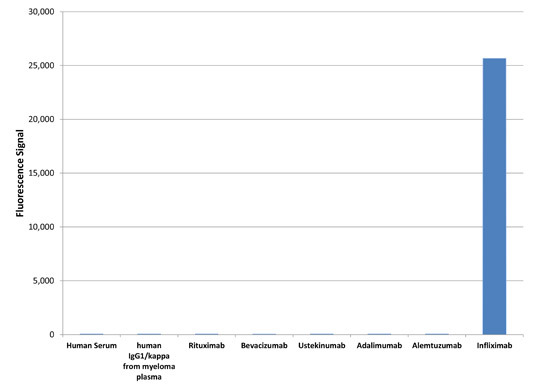 Antibodies Specific to Infliximab. Schematic image of PK bridging ELISA detecting free drug. Anti-idiotypic capture antibody, Fab format (purple), monoclonal antibody drug (gold), anti-idiotypic detection antibody, Ig format (blue), labeled with HRP. Fig. 1. Infliximab PK bridging ELISA using antibodies HCA212 and HCA213P. In Figure 1, Human Anti-Infliximab Antibody, clone AbD17837 (HCA212), was coated on a microtiter plate at 1 µg/ml and left overnight. Washing and blocking was performed with PBST + 5% BSA. PBST with 10% human serum was added, spiked with increasing concentrations of infliximab. Detection was performed using HRP conjugated Anti-Infliximab Antibody clone AbD17841_hIgG1 (HCA213P) diluted to 2 µg/ml in HISPEC Assay Diluent (BUF049A), plus QuantaBlu Fluorogenic Peroxidase Substrate. Data are shown as the mean of three measurements. Schematic image of PK bridging ELISA detecting total drug. Anti-idiotypic capture antibody, Fab format (purple), monoclonal antibody drug (gold), anti-idiotypic detection antibody, Ig format (blue), labeled with HRP. Fig. 2. Infliximab PK ELISA bridging format using antibodies HCA214 and HCA216P. Measurement of total drug with Human Anti-Infliximab Antibodies HCA214 and HCA216P. In Figure 2, Human Anti-Infliximab Antibody, clone AbD19376 (HCA214) was coated on a microtiter plate at 1 µg/ml and left overnight. Washing and blocking was performed with PBST + 5% BSA. PBST with 10% human serum was added, spiked with increasing concentrations of infliximab. Detection was performed using HRP conjugated Human Anti-Infliximab Antibody, clone AbD19376_hIgG1 (HCA216P) diluted to 2 µg/ml in HISPEC Assay Diluent (BUF049A), plus QuantaBlu Fluorogenic Peroxidase Substrate. Data are shown as the mean of three measurements. Fig. 3. ADA bridging ELISA using antibody HCA213. In Figure 3, infliximab was coated at 1 µg/ml on a microtiter plate overnight. After washing and blocking with PBST + 5% BSA, PBST with 10% human serum was added, spiked with increasing concentrations of Human Anti-Infliximab Antibody, clone AbD17841_hIgG1 (HCA213). Detection was performed using HRP conjugated infliximab at 4 µg/ml in HISPEC Assay Diluent, and QuantaBlu Fluorogenic Peroxidase Substrate. Data are shown as the mean of three measurements. HRP conjugation of infliximab was performed using a LYNX Rapid HRP Antibody Conjugation Kit®. Infliximab still capable of binding to the immobilized Anti-Infliximab Antibody was detected by adding HRP conjugated anti-human Fc-specific IgG antibody (MCA647P), plus QuantaBlu Fluorogenic Peroxidase Substrate. Fig. 4. 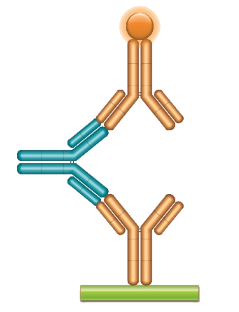 Anti-Infliximab Antibody HCA215 binds both infliximab and the infliximab/TNFα complex. Fig. 5. Anti-Infliximab Antibody HCA213 is specific for unbound infliximab and does not bind to the infliximab/TNFα complex. Fig. 6. Inhibition of infliximab binding to TNFα by antibody HCA213. In Figure 6, TNFα was coated on a microtiter plate at 1.0 µg/ml. 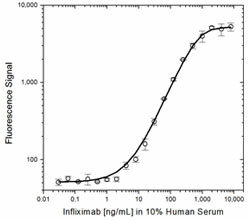 Following coating, a pre-incubated mixture of Human Anti-Infliximab Antibody (HCA213), titrated into a constant amount of infliximab (IFX, 0.3 µg/ml) was added. Free infliximab still capable of binding to the TNFα coated plate was detected using HRP conjugated Anti-Human Fc-Specific IgG (MCA647P). The data are shown as the mean of three measurements. Fig. 7. Demonstration of the specificity of antibody HCA213 to infliximab. In Figure 7, antigens were coated at 5 µg/ml on a microtiter plate overnight. After washing and blocking with 5% milk powder in PBST, HRP conjugated Human Anti-Infliximab Antibody (HCA213P) was added. Detection was performed using QuantaBlu Fluorogenic Peroxidase Substrate. Non-inhibitory Type 2 antibodies HCA214, HCA215, HCA216 and HCA216P recognize an epitope on infliximab that is shared by other closely related chimeric antibodies, such as cetuximab. 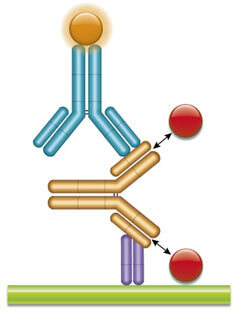 These anti-infliximab antibodies have been shown to bind to the chimeric antibody cetuximab, but they do not bind to the chimeric antibody rituximab.